For those ancestors of ours who settled in the 18th and 19th centuries in Pennsylvania, Maryland, Ohio, Virginia and Delaware, many were of a German and Swiss heritage, referred to as “Pennsylvania Dutch” or “Pennsylvania German”. The term Dutch did not mean they were from Holland. The ‘dutch’ term came from ‘deutsh’ which meant German. Besides using the German language and writing, there was a distinctive handwriting style known as ‘fraktur’ with black lettering in a bold and striking design. 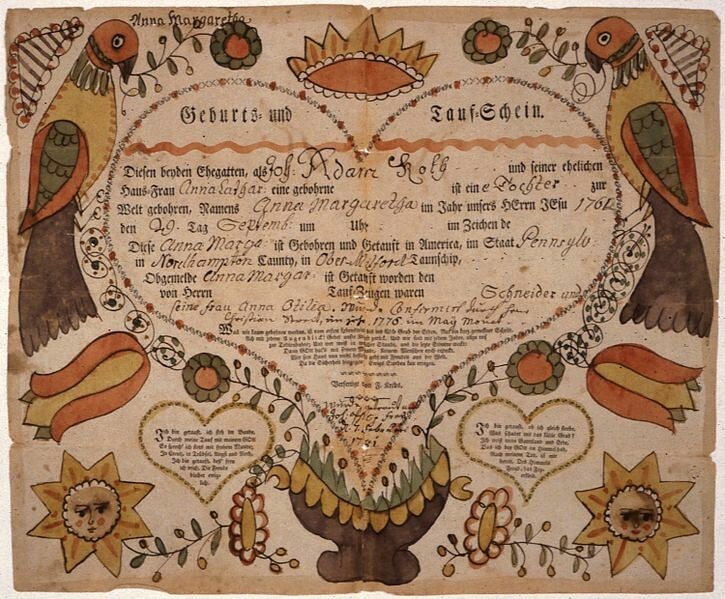 The Pennsylvania German began in 1740 in America using this writing styles as a folk art and placing it on their formal certificates for marriages, births and other documents. This type of calligraphy would have drawings of birds, flowers, hearts and other floral designs. They were quite artistic even in listing their own family information: names, births, marriages and deaths. These early form of record keeping became very important in the late 18th and early 19th centuries when soldiers form the American Revolutionary War applied for pensions. Most people did not have any birth certificates or registration to show proof of family, location, name and age. However, the tradition of the fraktur records had long been established and proved to be a great asset in gaining the pensions for the soldiers; especially those from the Pennsylvania Dutch communities. These very ornate documents known as ‘Fraktur Records’ were placed in the case files of those seeking a war pension or a bounty-land warrant. The U. S. National Archives has them scanned and you can search to see if an ancestor submitted one. The Common Wikimedia site has placed these images, some 219, online so you can view them easier and if you find one you want, you can download the image as they are part of the public domain. Each is scanned in a very large size and one in a smaller size. When you select one, click on it and a larger view appears. Scroll down and any available details of the person’s name and location are presented. You can right-click on the image to save it or use the icon button on the right for assistance. Now there is no search box to find an ancestor with all the frakturs available. Instead you would have to go through each, noting the names in the description, of which there can be several. Careful, surname spellings may have changed over a period of time, so be flexible about whether a certain individual is listed. Even if you look at them just for their artist appeal these frakturs are fun to explore and see what might be discovered.